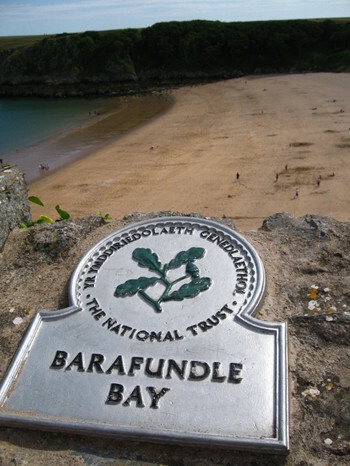 Pembrokeshire has to be one of the most beautiful places in the UK. We had such a lovely week, and it was all over far too quickly. We had fabulous weather, and went on the beach every day - some days twice as we took Bodie every evening for a swim too. The girls rode their bikes (they both had new ones for their birthdays and Ruth had learnt to ride hers by the end of the week). We spent a day in St Davids which was very pretty but explained why no one was on the beach - they were all wandering around the town and cathedral. The beaches are amazing - gleaming white sand and crisp blue sea with trees coming down to the sand. The best bit was that they were virtually deserted too. 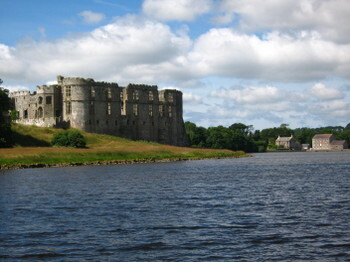 There are castles everywhere - this is Carew Castle, which is really impressive. Unfortunately I was distracted by the gorgeous house next to the mill in the background, which looked like somewhere I could live!! 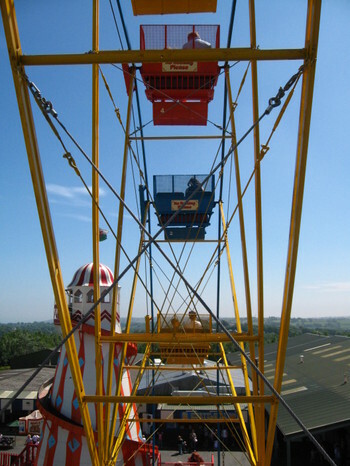 Ruth had her birthday on Wednesday so we went to Folly Farm as a treat, and they went on their first ever Ferris Wheel, fed animals, ate ice cream and then had fish and chips on the seafront in Tenby. Bliss. 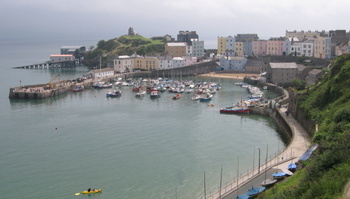 Tenby harbour - the seafront is really pretty with lots of interesting houses and tiny alleyways. We took over 500 photos while we were away, so be thankful I didn't post more! Half an hour after arriving at our cottage Bodie decided he wanted to explore and jumped out of the girls' first floor bedroom window. He must have some cat instinct in him as he landed on his feet and walked away as if nothing had happened, although he did graze his chin and therefore it looked like he was sticking his tongue out for the whole week. A few trips to the sea helped it to heal and it won't be long before the hair grows back! We came back on Saturday, I did heaps of washing and am now in 'sorting the house out' mode. I don't know if any of you suffer from this phenomenon, but whenever I return home from being away I have an overwhelming desire to tidy out cupboards, rearrange furniture and generally 'play house' for a while. I am going to be able to indulge my slightly sad desires as the girls are off on their hols again tonight. They are going to stay with my parents for a few days and I am planning a huge revamp of their bedrooms and the basement while they are away. They are really excited as they have only been to stay without us once before, and it was a huge success for everyone involved. My aunt and uncle have just bought a canal boat and are cruising the waterways on their sabbatical and are at the moment very close to my parents, so they are going to go on that too, which will be fab for them. So, aside from a surprise barbecue to celebrate a friend's retirement and a trip to another friend's house for a paddle in their giant pool, we have been mooching around here since we got back. A trip to the allotment is called for asap as the weeds (and veg) have gone 'whoosh' since we've been away. We have been on a picking mission since we got home, but not for any length of time. We are also meant to be tending Sophie's half while she is away for the next 3 weeks. I am freezing peas and broad beans and we are eating our way through as much as possible - everything seems to come at once, so we will be almost-vegetarians for a while to get through it all. I also picked some blackberries, which struck me as very early. We haven't even got any raspberries yet (although they are Autumn fruiting ones). Having the allotment makes me feel very in-tune with nature and the seasons and I love eating food at the correct time of year. It seems wrong to eat asparagus and strawberries in Autumn, and I look forward to each season for the different food on offer. We had Ruth's party before we went away, and that went swimmingly. We were all exhausted by the end of it though and were glad of the holiday! 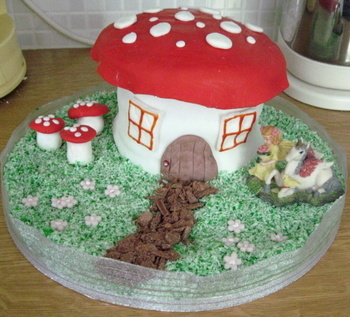 This is the fairy toadstool house birthday cake, which Ruth was very taken with. I found a picture on Google and tried to copy it, but it didn't turn out quite like the picture! 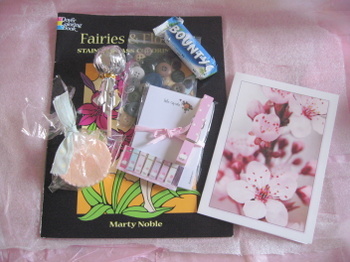 Before I go I must also say a big thank you to Mollycupcakes for her lovely giveaway. The fairies and flowers colouring book was snaffled up by the girls instantly and kept them occupied during the quiet lulls on holiday. The bath treats, buttons and notepad are definitely mine though. Andy ate the Bounty before I had chance to blink (to be fair he didn't realise it was mine, or he would have thought twice!). Thank you Catherine - it was a lovely treat. Thank you all for your lovely comments on my last post. Well, life is chaos as usual in the Pink Green household. I have decided I thrive on chaos (which is just as well really!) and that I would be bored if life was smooth and ordered. We had a huge party for my parents at their house at the weekend to celebrate their semi-retirement, birthdays and wedding anniversary. Actually, it was just a good excuse for a party and we had about 40 or so people there. It was lovely, and my parents really enjoyed themselves. Unfortunately I was too busy catering and mingling to take any photos, but take it from me it all went well! My Aunt and Uncle have just arrived from Alice Springs, Australia, for a 6 month sabbatical and they were there, which was really great. They bought a canal boat 2 days after stepping off the plane and are off to explore Britain's waterways for the next few months so we should be seeing more of them shortly. I am trying to be a little greener this year and have tried to steer clear of the plastic tat which usually goes in party bags only to be thrown away or eaten by the dog within minutes. As there are 6 weeks of potential boredom looming I thought something creative was in order, and I am pleased with the outcome. I have a chocolate cake in the oven as we speak and am aiming for a fairy toadstool house. Wish me luck! Other exciting news just in is that I have just booked a holiday! Starting on Saturday! And I have 4 loads of washing to get through, a party to organise, presents to wrap and a pub-fest to celebrate the last day of term (for me, not the girls), before then! Again, wish me luck. We are off to Pembrokeshire to the most beautiful looking cottage in the grounds of a manor house with sea views and sheep (so Bodie may not be coming home with us). Yesterday we were planning to go camping for next week, but the weather isn't meant to be great and the thought of sitting in a tent with 2 crabby children and a smelly labrador didn't really appeal, so we thought we deserved a good break as we have all worked very hard recently (girls included) and we are in need of some r & r.
I am also a very lucky girl for other reasons too. The postie knocked on my door yesterday and presented me with these lovely, lovely treasures from Jess at The White Verandah. I won her give-away, and I think the loot must have been packed with just me in mind! There was a beautiful flowery teacup and saucer, a rose-embellished lidded pot, fabric, lace, an embroidered tray cloth (which is perfectly adorning my pink stripey chair), a crocheted doily, a spool of pink ribbon, a birthday card which I am going to give Ruth next week, and the most amazing Apple Dumpling flavoured sweets. I was very touched by the generosity of Jess. She has a lovely blog, and a great website (that I have purchased from before - check it out as it is fab). Thank you again, Jess. That's not all, folks. I have also been given these 2 awards. 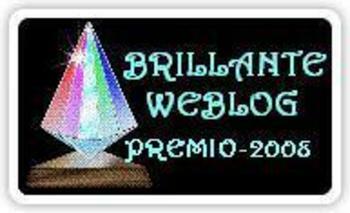 The "Brilliant Weblog" award is from Knitty, Vintage and Rosy, who has a really inspiring blog and home that I only discovered fairly recently. The pictures of her garden make me want to sit in it with a book and a Pimms for hours! It's a shame she's so far away. Steph at Curlew Country also gave me a "You Make My Day" award, which in turn has made my day. 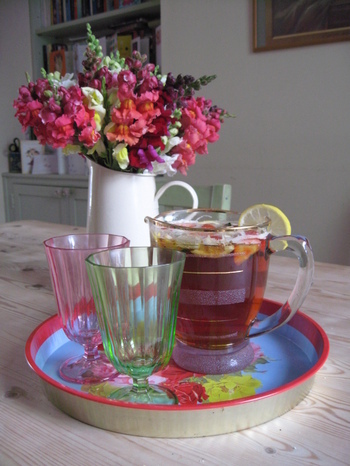 She also has a fabulous blog that I know most of you visit, and is an all round good egg! So, thank you both very much. I would like to pass on both awards to the following (and I'm sorry if you've had them before), and these are just some of the people who, in my opinion, have a Brilliant Weblog and who also Make My Day. Jess at The White Verandah (and not just because she sends me lovely things). 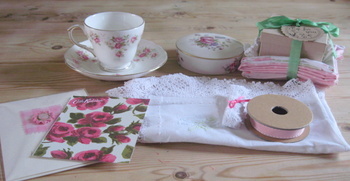 She has a lovely blog and makes me smile (not just by sending me lovely things!). 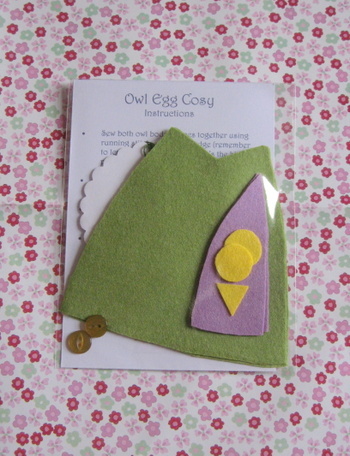 Val at Dottycookie for joining the allotment club and for giving me inspiration. And for replying to every single comment I have ever sent her. Jeska at Lobster and Swan for being one of the first people to leave a comment when I started blogging, and for having such gorgeous ideas and photos. She is a real source of inspiration. Annie at All Things Lovely. Sorry Annie, I know you've just received both of these, but you do have a Brilliant Weblog and you do make my day. I love your blog and allotment stories and can't wait to meet up to talk about them in person! Mia at Mias Landliv for having such a lovely blog and giving me inspiration. Also for taking such great photos of Norway to make me look forward to next year even more (we are hoping to go to Sweden via Norway next Summer). Lisa at Primrose Hill for giving me food for thought and daydreams (I want her life!). 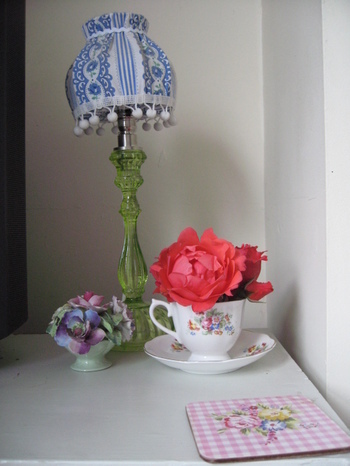 Patricia at Shabby Roses Cottage for using such bright and cheerful colours and for making such beautiful things. She is also a great source of inspiration. I know it's a cop out posting both awards to the same people, but I have got a party to plan and a holiday to pack for! And I did add a couple of extras for good measure. Hope you have a good week or two. I will look forward to hearing whether or not you are surviving the holidays when I get back from sunny (fingers crossed) Pembrokeshire. This is one of the nicest meals we have had this year - our own from start to finish. 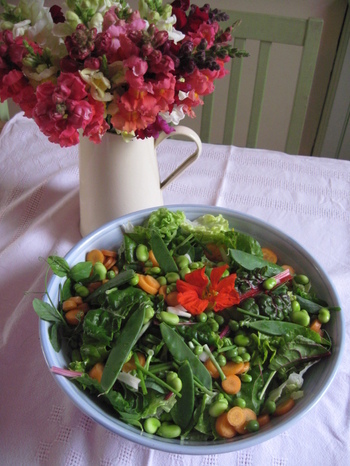 It is a mixture of Rainbow Chard, Oak Leaf Lettuce, Pea Shoots, Peas, Broad Beans, Mangetout, Spring Onions, Carrots and 1 Nasturtium flower (plenty more on the way but still buds at the mo!). The bowl is the biggest I own (it is huge) and we ate every last morsel. The girls even fought over it and as I tried to break them up Andy told me to treasure the moment - they don't often fight over salad! 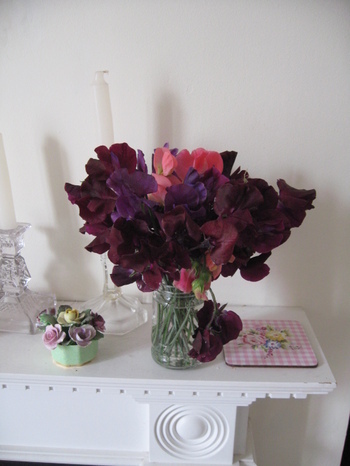 The allotment isn't just good for veg - despite Andy's annoyance I have managed to squeeze in a few flowers too. I never through I'd say it but I am slightly sick of Sweet Williams now, despite having given masses away, but the Snapdragons (above) and Sweet Peas are coming into their own now to take over. This one is actually from my garden at home - a little rain splattered but still beautiful. So, moving on from gardening, I have an exciting announcement. I have a job!! Hurrah!! At long last I have been offered a job starting in September at the girls' school as a teaching assistant. It is only for 1 day a week to begin with, but fingers crossed it may well lead to more. I haven't booked in the ironing lady yet, but you never know!! I am working full time this week again filling in for the TA in the Year 1 class (which happens to be Ruth's class), and I am loving it. I can see that if I were to work full time for a while I would become stick thin - I have barely sat down today! So, bye bye Pink Green Creations. Although I did enjoy sewing and doing fairs and the website, the financial return for what actually is a huge amount of work in hours (as I know many of you know) was not worth it for me. I miss making things (no time at the mo), but not to sell - I want to make things for me. I have a list as long as my arm of things for the house, and clothes for the girls. I want sewing to be a hobby, and to have a regular income each month in a job where I get to make a difference, so this will be perfect. Also, I am sure many of you are noticing a slump in sales as people become more cautious over money in these turbulent economic times. I am a little sad to be 'walking out' on my business, but it served a purpose for a very long time, and things move on. I may do a 'blogshop' soon as I have fabric and bits and bobs to get rid of, and I may use it as an excuse to potter with the sewing machine from time to time, but it will be a lot less formal. Aside from worky things, I have been having a fun time in other areas of my life too. My book group meeting last week was fab - we went to a member's house out in the wilds of Gloucestershire to a very pretty cottage which had a massive garden with rabbits hopping across and chickens pecking around. We had huge glasses of Pimms, and the book discussion was irrelevant really! Just kidding - we did have a good discussion, but for me it was overshadowed by my awe at the lovely setting. You can't beat good friends, intelligent discussion and a good old glass of Pimms whilst watching the rabbits skipping across the lawn!! One of my more traumatic jobs this week was to do not one, but two presentations to a very good friend of mine who is leaving work as a teacher and assistant head at the school after 22 years. The first presentation was after a Governors meeting, where I managed to say 1 sentence and then we both started sobbing, but the second was a little more successful and I did get to the end of my speech and even most of my friend's before we both had a cry!! The second one was at the school fair in front of all the parents and staff, so I am glad I had the practice run. Despite the fact that she is the same age as my mum, we hit it off right from the word go 4 years ago when Grace started school, and have been very close friends since then. I will be sad not to see her at school, and I am so glad she taught both of mine before leaving, but I am looking forward to the long lunches and days out she has planned already! Better not work full time for a while! Grace's birthday went very well. Actually I hardly saw her as she was at school, popped home for party tea and some High School Musical dance matting (a big thank you to my parents for that one! 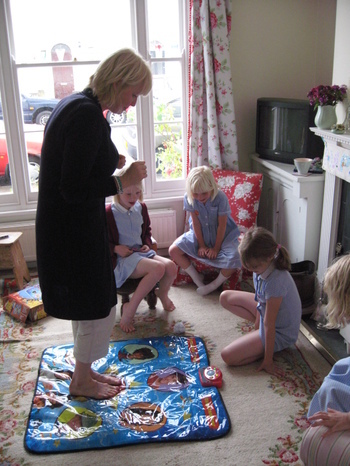 ), and then went off to Brownies armed with birthday cake for them all. This is Sophie by the way, not Grace. Grace is the one with the bunches! We got Grace a bike (almost big enough for me to ride), and she has been off down the cycle track with Andy several times already. Ruth is getting one too (it's her birthday in 2 weeks) so we can all go out together, but shhhhhh - don't tell her! So, sorry for the long, wittery post, but I am finding more and more that I treat this blog as a diary for me to read and go back to, rather than a treat for you all to read! Hope you're still sticking with me!